Drink Pairings — Happy Food Co.
Offers a lively palate with hints of red fruit, complemented by delicate bubbles and a refined, subtle finish. Juicy IPA bursting with tropical fruit flavors and aromas of nectar and citrus. This Pinot Noir delights the senses with a bouquet of toasted oak and ripe raspberry. Plush and smooth, the mouthfeel is round and filled with luscious layers of red cherry and strawberry that are complemented by notes of brown spice. Malbec red wine with the deeply concentrated flavor of plum and additional flavors of dark cherry and blackberry. Hints of brown spice and vanilla contribute layers of complexity. This Chardonnay displays flavors of green apple, orange zest and apple pie, complemented by notes of butter and toast. The rich, nutty flavors lead to a silky finish and a plush mouthfeel. This full-bodied Chardonnay offers inviting aromas of roasted pears, lemon citrus and subtle baking spice with elegant layers of pineapple and crème brûlée flavors. Offers tropical fruit and floral notes with hints of vanilla and spice. This Chardonnay also offers flavors of baked apple, lemon and white peach accentuated by touches of spice and honey. Offers aromas of bright citrus, lemon meringue and peach underscored by hints of fresh apricot. Subtle notes of toasted vanilla and a hint of brown spice from oak aging are framed by a luxurious mouthfeel. This Chardonnay has vibrant aromas and flavors of juicy pears, apples and subtle notes of tropical fruits. Hints of sweet vanilla and oak are complemented by a bright acidity. This medium bodied wine has a finely balanced acidity with a long, clean, crisp finish. Offers aromas of blackcurrant leaf, nettle and jalapeño with notes of grapefruit, guava and passion fruit. 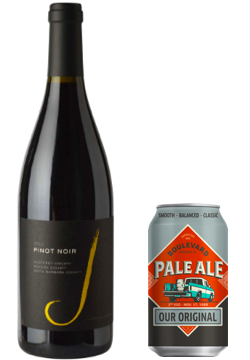 With aromatic notes of black cherry and baking spice, this pinot noir features bright, fruity notes of cranberry, fig and fresh orange peel, with hints of dark, brambly fruit, black tea and clove. Opens with aromas of black cherry, plum,and fresh blueberries complemented by hints of brown spice and baking chocolate. This medium bodied wine has a finely balanced acidity and is offers notes of grapefruit, guava and passion fruit. Offers tropical and citrus blossom aromas with a crisp acidity. Flavors of pear, green apple and white nectarine elegantly blend to create a delightful Pinot Grigio. Opens with intense aromas of blackberry, plum and a hint of mocha. Dark fruit flavors intertwine with notes of spice, licorice and chocolate to create a magnificent, full-bodied Malbec. A clean, crisp and refreshing local artisanal sparkling cider that’s made from a blend of freshly-pressed apples.